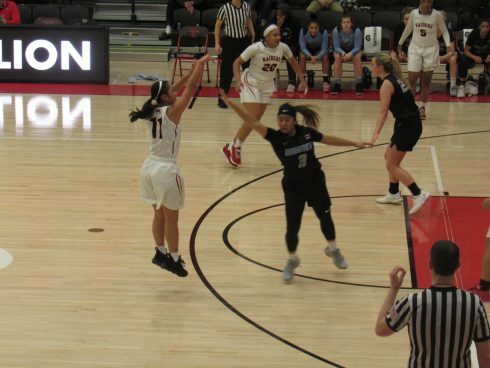 Southern Oregon trailed by as many as 17 points in the second half before the Raiders rallied to force overtime and pick up a 83-72 victory over Northwest Christian Saturday night in the regular-season finale for both teams. 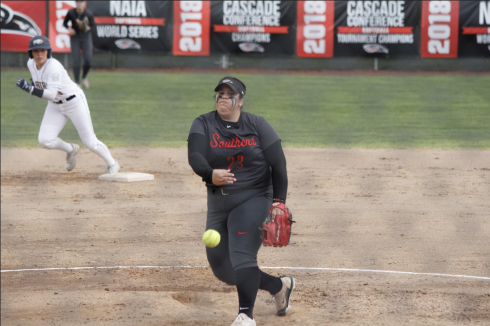 With the win Southern Oregon improves to 17-12 overall and 10-8 in Cascade Collegiate Conference play. Northwest Christian falls to 11-19 overall and 4-14 in the CCC. The Beacons’ season comes to an end with the loss, while the Raiders will travel to Portland for a first-round matchup with third-seeded Warner Pacific at 7 p.m.
Eric Thompson led all scorers with 34 points on 9-of-16 shooting for the Raiders. Jordan Highland added 18 points and six rebounds in the win. Brody McGowan led Northwest Christian with 17 points and Jordan Buhler and Trevor Parker each added 15 attempts. Brian Hampton tallied 13 points for the Beacons in the loss. Southern Oregon built a six-point lead following a layup by Joe White with 8:51 to play in the first half. Parker hit a three-pointer to spark a 21-4 NCU run to end the first half, with a Travis Pacos layup in the final minute giving the Beacons a 37-26 halftime advantage. The Beacons hit back-to-back three-pointers to open the second half and push their lead to a game-high 17 points. Southern Oregon responded with 29-11 run to pull within one point on a Kyle Tedder layup with 5:40 to play. Hampton made a three to halt the Raiders’ run, but Thompson responded with a three and a Highland layup with 29 seconds to go gave SOU its first lead since the opening half. Hampton made a free throw with six seconds to go to tie the score at 63-63 and force overtime. Thompson scored 12 points in the overtime period, including the first four when he made a pair of free throws and hit a layup to put SOU up 67-63 with 3:55 to play. For a while, the overtime period became a free throw-shooting contest, as Thompson made all four of his attempts and Buhler and McGowan each went 2-for-2 at the stripe. Highland added another free throw for the Raiders when he completed an and-one play following a layup, giving the Raiders a 72-67 lead with 2:26 remaining. After Buhler made two more free throws, Thompson dropped a three-point dagger with 99 seconds to go to push SOU’s lead to six points. Thirty seconds later Tedder made a pair of free throws to put SOU up by eight with just over a minute to play, and the Raiders made 13 of 15 attempts at the charity stripe in the overtime period to pull away to the 11-point victory. Northwest Christian shot 55.2 percent (16-of-29) in the first half while limiting the Raiders to 27.3 percent shooting in the period (9-of-33). The Raiders bounced back in the second half, shooting 56.5 percent (13-of-23) and made three of their four shot attempts in overtime. Southern Oregon out-rebounded NCU 44-28 in the game.